At some point Monday afternoon — as the final groups of runners were staggering across the finish line on Boylston Street for the 2012 Boston Marathon — my wife and I were waiting to cross the street near Boston's Public Garden, next to a very tired man with a blanket wrapped round his shoulders and a woman, who for the purposes of this conversation I will surmise was either his wife or girlfriend. "You OK?" she asked him, innocuously. "No. No, I'm not OK. I mean ... medically, yes, I'm OK. But I'm not OK. No. No." And that would pretty much describe everyone I saw at or near the line that Monday. The surprisingly large group of people who ran the marathon and finished it — which included my brother, Jack, a distance runner in high school and college and usually among the top finishers at the Mercedes Marathon in Birmingham — were directed after the race to a "Family Meeting Area," roughly a half-mile from the finish line. Yes, they make people who run 26.2 miles in grueling conditions walk another half-mile to find their relatives and loved ones. Just because. I've never served in the military, but I imagine an active battlefield hospital would look similar to the scene in that area: people lying in the middle of the street moaning, people taking IVs, people in wheelchairs. The ones who appeared healthy were just sort of sitting there, blank looks on their faces, as someone they knew attempted to force them to eat or drink something. None of them were really interested, and who could blame them? 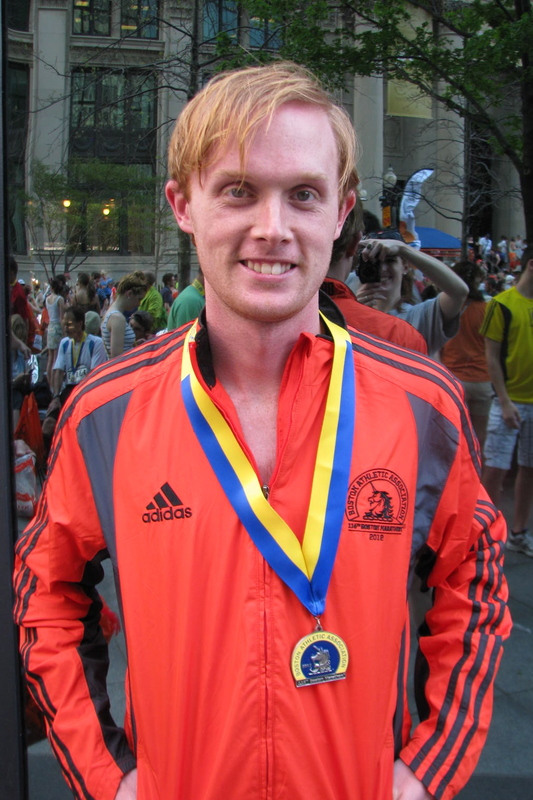 The weather, it should be noted, was way too hot to stage a marathon. Organizers and officials knew it, and so they advised everyone who wasn't a "serious" runner — people who were running for charity or some such — to skip Monday's race. Even Jack — a "serious" runner who qualified with his time in his first Mercedes run — dragged for the majority of the race; by the time he reached our position at the top of Heartbreak Hill between miles 20 and 21, he looked like he just wanted to ooze across the finish line and go home. So the final time for him was a tad disappointing, as it was for just about every runner who participated in the race (at least the ones who talked to me). But there is some sort of triumph involved in simply being there, and everybody who participated knew that. The guy sitting next to me on our flight out of Boston said as much: "Turns out, I got the same medal the winner did. Although I didn't get that wreath." • I say this every time I go to an event like this, whether it's a 5k or a marathon or a bike race, but the sub-culture of "fitness" people is a little creepy. 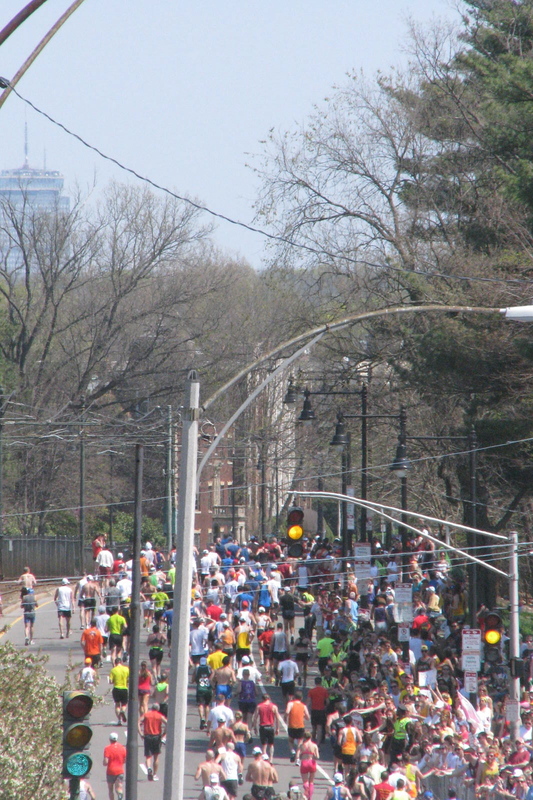 For one thing, every participant in the marathon was easy to identify the entire weekend, not by how lost they seemed trying to figure out the trains, but by the fact that ALL of them appeared to have packed nothing but running gear for the weekend. Seriously, on Sunday we walked for a bit along the Freedom Trail ... along with about 400 other people dressed in running shorts and those weird running shirts that are somewhere between cotton and spandex. I'm not opposed to the gear itself — I wear that stuff when I exercise (very un-seriously), but c'mon. Nobody packed one shirt with a collar? Really? Of course, you couldn't walk 3 feet without overhearing skinny people's conversations about the race itself, or running in general. A lot of it resembled hipster conversation — "Yeah, I'm not really taking this race seriously; I like running Chicago better." "Really? Have you ever run in (some really obscure race in Arkansas that nobody's ever run)? It's pretty cool. A lot tougher than this." And many of the folks who ran the race were still wearing their medals 24 hours after the race was over. Enough already, guys. We get it. • Maybe this out of school, but figuring out the logistics of the race was like searching for buried freaking treasure. You would think they would make it simple for the runners — things like, "How to get to the starting line" or "How to find the expo where you pick up your bib and your packet" would be brainless activities. They are not. In fact, we would've never found the expo, except that we blindly stumbled into someone who knew where it was (and even then, we took a wrong turn and wound up nowhere). That's not all the confusion — one dude I met at the hotel was running in the same wave as Jack and thought he didn't have to be at the starting line until 8 (they had to be there at 6:30). And there was absolutely no way to travel to the starting line, I was told, as a spectator, unless I planned to stay there all day. It was migraine inducing. 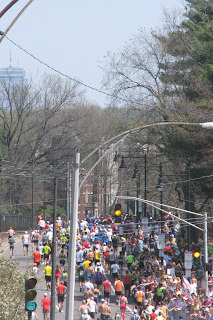 • I can't decide if the huge crowd that turns out to support the runners is a good or a bad thing. I mean, I'm sure it helps your energy levels to have people cheering for you — Jack said he stopped to kiss a Wellsley girl, just because — but at the same time, at the top of that hill, there has to be a part of you that wants to curse everyone and tell them to pound sand. • My brother Whit wanted me to note in this spot how frustrating it was to follow the race from Florida. Apparently the live feed cut off as soon as the male winner crossed the finish line. His exact words: "Punch somebody." • One more leftover Boston story: On Sunday we took the train to the North End, in search of an Italian restaurant recommended by a friend of mine named Sam. Of course, by the time we reached the place, the line was way out the door ... and all those people had reservations. So we're trying to decide what to do next — it was already after 6, and we needed to knock off early so Jack could get back to the hotel and rest before the race the following morning — and Mom pops in at the place next door, to see what their wait time was. The owner, a scary looking dude, says the following: "You have been next door? ... Since they take business from me, I take business from him. Sit." Dinner, of course, was excellent.